Proposals for the route are open for consultation until 10 February and are on public display in Stratford on the 19th and 20th of January (details below). 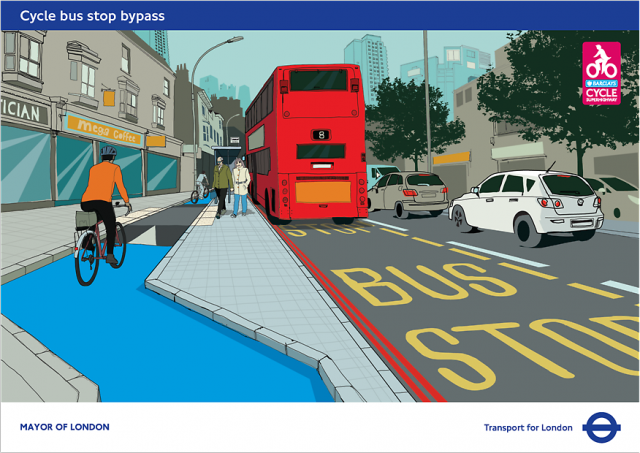 In it's response to the plan the campaign group says it is “delighted with many aspects of the designs,” such as the inclusion of 2.4 kilometres of segregated cycle lane on Stratford High Street, which it points out are sufficiently wide so as to allow quicker cyclists to safely overtake those who are slower. New innovative bus stop and traffic signal bypasses to help cyclists get ahead of other traffic and improve safety. Industry-recognised safety training for drivers of large goods vehicles. LCC has welcomed the way the lanes are routed past bus stops – the latter, in effect, become islands with the lane running between the stop and the pavement – as well as the fact that the space required to create the cycle lanes has been taken from the main carriageway, rather than the footway. Despite those positives, LCC says it has a number of reservations about the plans. First, it points out that the ‘extension’ does not in fact complete the route as originally planned; nothing has been announced about a proposed third section from Stratford to Ilford. It also raises concerns about the safety of cyclists on Bow Roundabout due to the deployment of early start traffic lights which it says aren’t suitable for such a large junction, the dangers still posed by the Stratford one-way system, problems with accessing the northbound lane from, as well as over two-stage right turns for cyclists. Finally, it takes issue with the proposed use of staggered pedestrian crossings, saying that these are out of step with the desire lines that people on foot will typically use to cross a road. In conclusion, LCC says “we strongly welcome TfL’s decision to use segregated cycle tracks on this busy main road, removing road space from motor vehicles, not pedestrians, in order to accommodate cycling. It adds that it will make its detailed submission to the consultation public on 11 February, the day it closes. Derided by many as nothing more than a lick of blue paint when the first Cycle Superhighways were opened in 2010, the plans released by TfL reflect the hard work of campaigners in ensuring that the safety of cyclists is uppermost in planners’ minds, added impetus given by the death in October 2011 of Brian Dorling at what is currently the eastern end of CS2, where it joins Bow Roundabout. His death, plus those of other cyclists in late 2011, led to cycle safety being put centre stage during last year’s mayoral election campaign, and pressure put upon Mayor Boris Johnson by cycle campaigners and opposition politicians caused him to order a review of existing key junctions in London as well as those on the Cycle Superhighways yet to be built.